As hunters, we’re always looking for an edge to increase our odds of seeing and hopefully harvesting game. That edge may come in the form of better optics, a shooting platform or going all in on scent control and camo. But what about inviting the deer to a meal? Yes, I’m talking about feeders to help increase your odds in the whitetail woods. Before you start clicking on links and ordering feed, be sure to check out this website and visit your state’s regulations regarding feeding and baiting of wild game. There are really two different kinds of feeders you can use to attract deer to your hunting area. The first and most simple of devices is a gravity feeder. As the name suggests, it consists of some sort of hopper to pour the feed into and a chute or tube the feed falls into that the deer can eat directly from. Some models have a single feed chute, some have multiple chutes. The second type of feeder is one that operates with a timer and a dispenser. Again, you have a hopper for the feed and at the bottom of the hopper a battery-powered device that allows you to set a time the hopper opens to dispense feed. Some of the timers will allow you to set intervals so the feeder is dispensing food multiple times per day. Usually, these feeders have a long-life battery to operate the timer and dispenser but some models may have a solar charger you can add to keep the feeder operating longer. What Feeder is Right For You? First, determine if your state or hunting area allows the use of feeders. Second, determine where you are going to place your feeder. A feeder full of corn probably is not going bring many deer in if you place it just inside the tree line off a field of fresh corn. When choosing a place for your feeder, don’t forget to ask yourself how you are going to access it. Are you in an area that you can reach only on foot and therefore have to carry the feeder and all the feed on your back? 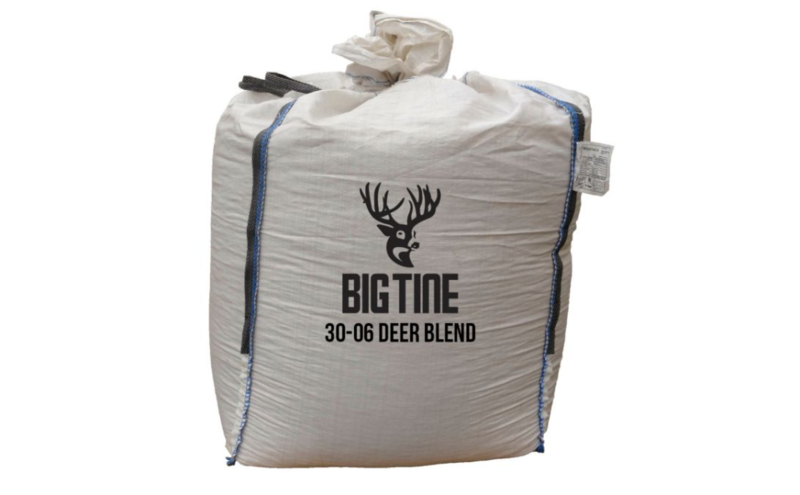 This Big Tine deer feed comes in 1,000 lb and 2,000 lb bags…that’s a lot of deer. Can you drive relatively close with an ATV or tractor? You are responsible to service and maintain your feeder. Be sure access does not begin to limit your enthusiasm for checking your feeder regularly. Third, determine how many deer are in your area. If you don’t have a huge number of deer, maybe you can get by with gravity feeder with a small hopper. However, if you live in an area thick with deer, maybe a large hopper with an interval dispenser is better to keep the deer happy and coming back. Fourth, figure out what kind of food the deer in your area prefer. Deer aren’t terribly picky and their noses will lead them to food sources that are attractive. Corn is always a good bet. I’ve seen mule deer, whitetail, and black bears come running to piles of sweet feed in the past. Sweet feed is just a tasty mix available at the feed store to supplement horse diets. Remember, if a deer can smell the tasty snacks, so can bears, skunks, raccoons and all manner of forest dwellers. Bears may do a number on your feeder if they find it. For a simple way to get started check out the Moultrie Feed Station. This is simply a UV-resistant plastic feeder that straps to a tree or fence post. You fill the feeder with 40 pounds of your favorite deer food and walk away. No batteries, no timers, no moving parts. Between the low price-point and that sweet, sweet Amazon shipping – this a great way to see if you have critters in the neighborhood. This feeder will hold up to 80 pounds of feed. It is built to mount directly to a T-post or you can strap it to a tree or fence post. The large feed mouth allows deer to easily access the feed and the lip at the bottom helps prevent feed from spilling on the ground. The T-post feeder comes complete with hardware and mounting bolts making set-up that much easier. This 300-pound capacity feeder will keep all the deer in the neighborhood happy. You will need some vehicle access to set this feeder up and keep it stocked. It is recommended that you set it on a 4×4 post. The unit is made of UV-stabilized polyethylene and is reported to have a very robust water-tight seal on the lid to keep your feed dry. With four feed mouths, multiple deer can feed and get their fill for days at a time. But this feeder isn’t cheap, with it you are really committing to managing and improving the deer herd on your land. If you’re not ready for that yet, Banks also has a 40-pound feeder with two feed mouths that can be easily strapped to a tree, fence post or 4×4 and is almost one-third the cost. This unit is Moultrie’s basic feeder. It features a 30-gallon hopper constructed of UV-resistant plastic. The legs support the hopper so the top is 5.5 feet off the ground and the dispensing plate is able to sling feed up to 25 feet with fresh AA batteries. There is also a port to plug in an optional solar panel to keep the feeder operating longer between battery changes. The dispenser can be programmed to feed up to 4 times per day at intervals of 1 to 20 seconds. This is a great intro model for those looking to get into a programmable feeder! What’s your take on this affordable programmable feeder? The Hanging Econo Plus Feeder offers portability and ease of use. A metal bucket holds 40 pounds of feed and will feed twice daily with no programming. Intervals for the feeding can be programmed from four to 16 seconds. Additionally, you can adjust the dusk setting to be sure the feeder dispenses food 30 minutes before sunset. The feeder and timer run on a 6-volt battery and since this feeder is small, this is a great unit for hauling back off the beaten path. Just make sure to place it high enough that bears won’t take a swing at it. Fed by a 55-gallon drum this might be the Cadillac of deer feeders. 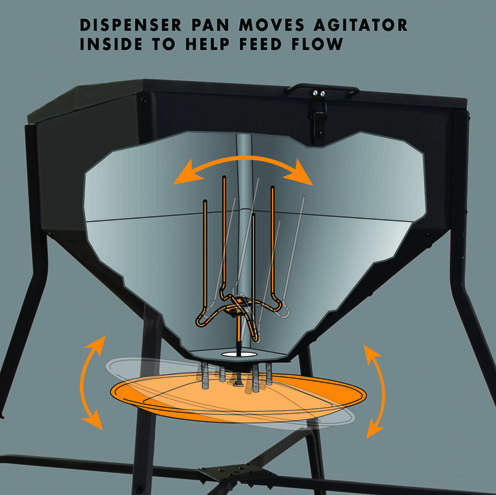 Featuring a digital timer program to feed up to 6 times a day, all-metal housing, barrel, spin plate, varmint guard and funnel – this feeder is built to last. It also sports a quick-lock adapter so that you can use any 55-gallon drum without any drilling or fitting. Nearly all the feeders that feature a motor-driven dispenser have a varmint guard option. If you live in an area with lots of nocturnal pests you should probably consider the recommended guards. They will help keep the little thieves out of the feeder mechanism and help eliminate jams and damage caused by raccoons, skunks, squirrels and such. If you live in an area with hogs be sure your feeders are anchored securely to keep the hogs from toppling your feeder over and dumping the hopper or damaging the unit. 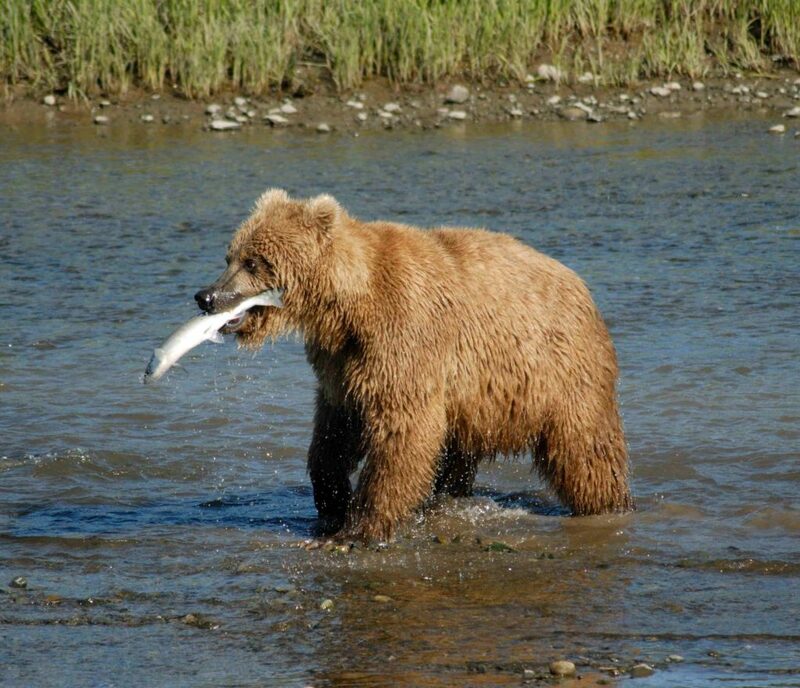 Bears can also cause a lot of damage. If possible, get the feeder up high enough that a bruin can’t take a swipe at the motor/timer unit and spill all your feed. Of course, this is not possible with a gravity feed unit where the deer must be able to reach the feed mouth. A quality game camera can help you identify what critters are actually visiting your feed sight so you can monitor the amount of feed you need to maintain a good feed station or to determine who or what is damaging your equipment. A feeder is a big responsibility. Be sure you are committed to putting in the time to keep the area clean and maintain your equipment. Having a feeder can provide you with the knowledge you need to be successful in your hunting endeavors and may even open your eyes to the possibility of bear, hog or predator hunting in your area if you catch them on a game camera. Additionally, a feeder provides an opportunity to take youngsters and new hunters out to view game and see wildlife up close. Let us know what feeders are working for you and share your tips with those new to using feeders in their hunting areas. For more of our favorite guns & gear…check out our Editor’s Picks. This may be a popular way to “harvest” a deer in certain parts of the country, but please don’t call it “hunting.” Shooting a deer at a feeder has about as much to do with hunting as watching Point Break has to do with actually knowing how to surf. I used moultrie feeders in past. Worst I ever had I would never recommend them to anyone. there are a lot better ones out there. They may cost more but it has to work or your hunt could be ruined. Thanks for helping out…could you let our readers know some specifics of why they sucked?